being played by Wolof folk musicians as well as by the Griots. This, however, is another discussion. but quite resembles our American banjo in shape. to banjo's 5th string, in the 3rd string position. the neck likewise grew on our property here. leaving the thinner diameter end to be mounted to the gourd/skin. First drill the guide holes the same diameter as the small end of the peg's taper. Altho I do have access to a (expensive) peg-hole reamer, I did not use it for my current Akonting project. screwdriver whose blade has the same taper as that of the fiddle pegs. neck settles-in about half of the neck's diameter. Not too critical. tensioning etc as you'd have to do when making a Kora. Rawhide (un-tanned) goat skin is regularly available on ebay, Amazon etc for around $7 to $15 or so. Cut out a circle of skin five inches in diameter larger than your gourd. Soak it in WARM (not hot) water for a few hours. Pat off excess water with a paper towel. MUCH AS YOU CAN with your fingers/hands. Repeat at 90 degrees then 270 degrees - pulling/stretching all the time. Leave a "skirt" of loose skin below the tacks all around - for glueing as extra insurance*. Tack halfway between existing tacks, all the way around. Aim to space tacks about 1/2 inch. is where the neck passes. Cut holes through the skin (at the two half-circles) that the neck will pass through and rest in. the neck - at the holes. 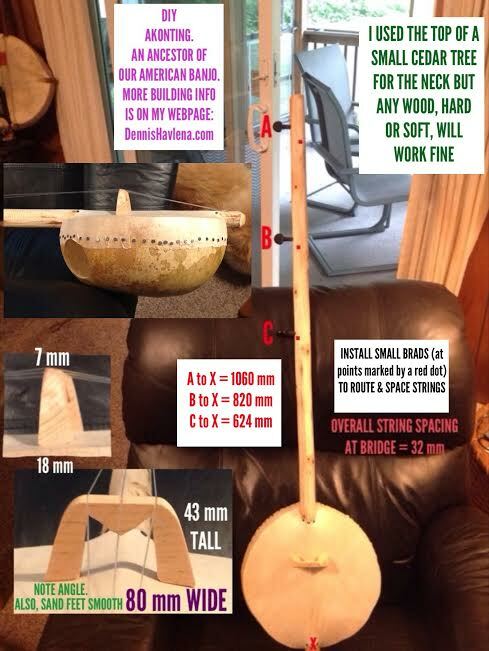 Do not tack the neck in the center. dries. This makes for a solid, no worries skin mount. I play. This greatly improves the tone & volume of this Akonting. The string action is SUPPOSED to be quite high! String gauge, for all three strings, is .028" (50 pound monofilament fishline). It's sometimes hard to find this large a gauge locally, but you can always buy it online. Some folks use thicker 60 pound fishline. dealing with how the desired notes are achieved) that are quite different - even weird - but fun. ONLY FIVE notes, in a single octave, are EVER played traditionally - the thing is pentatonic. - c,  the open shortest string which, traditionally, is never "fretted"
- E, the middle string, which likewise is never "fretted"
- D, the longest string is the ONLY string that is ever "fretted" ! These three notes are the ONLY notes ever played on the longest string! The G and A notes are the only notes that ever get "fretted". just fine. Other scaled are used as well. Easily researched on the internet. This youtube video helped me more than any in understanding west African Akonting music. The video is 8:05 long. Pretty easy to pick up. Clawhammer! many interesting examples on youtube.